When you think of Christmas, there are a lot of things that come to mind. Family. Falling snow. Steaming mugs of hot cocoa. But there's likely one specific object that's in each and every one of those scenarios: a Christmas tree. Getting into the holiday spirit just isn't the same if an evergreen isn't standing tall in the living room, dressed in homemade ornaments, bright lights, and adorned with a magical tree topper. But when exactly did people start chopping down trees and putting them in their homes? Some may think Christianity gets all the credit, but the tradition actually dates all the way back to the times of the ancient Egyptians. Whenever a winter solstice came around, the ancient Egyptians would decorate their temples and homes with evergreen trees and wreaths as a form of celebration. The prosperous plant represented everlasting life, peace, and opulence, which was important because winter was a time when their sun god, Ra, was ill and weak, reports History.com. After the solstice, Ra would slowly start glowing brighter and stronger, and an evergreen's immortality symbolized the triumph of life over death. The Egyptians weren't the only ones bringing the plant indoors, though. In Scandinavia, the Vikings believed evergreens were special gifts from Balder, their god of light and peace. And the Druids, an ancient Celtic priesthood said to walk the line between the gods and mankind, started bringing evergreens into the home around the 8th century, reports The Washington Post. Before then, the Druids worshipped oak trees as their idol. But English Benedictine monk St. Boniface, a man who devoted his life to converting pagans, offered the Druids a triangular shaped balsam fir tree as a symbol of the Trinity, and it went on to replace their beloved oaks. They then used evergreens to adorn their temples as a celebration of life without death, hanging mistletoe sprigs over their doorways and windows to ward off evil spirits of diseases. Though 16th century German theologian and priest Martin Luther is famed for sparking the Protestant Reformation, he's also credited with bringing the Christmas tree to Germany and introducing it to Christianity in the way that it's known today. According to History.com, German Christians built pyramids of wood and adorned them with evergreens and candles outside to celebrate Jesus' birth. Luther, in awe of the magical, sparkling trees shining bright outside, decided to recapture the beautiful scene for his family by bringing the tree inside and covering it with wire and candles. Most 18th and 19th-century Americans thought the tradition was odd though, and to some it was even taken to be a representation of paganism. According toPanati's Extraordinary Origins of Everyday Things, Plymouth Colony governor called it a "pagan mockery," and the general court of Massachusetts even implemented a law in 1659 that banned any observance of December 25 that wasn't a church service - including decorations. It wasn't until the late 19th century that decorated evergreens became the ultimate Christmas symbol we all know and love today. In 1846, the second longest-reigning monarch, Queen Victoria, was sketched with her children and husband, Prince Albert, alongside a Christmas tree in Windsor Castle. Because Queen Victoria was so popular (kind of like another royal family we know), the decision instantly became an iconic one and went mainstream worldwide. Ornaments flooded to the U.S., and trees started popping up in households across the States, Britain, and Germany. By the early 20th century, Americans had large floor-to-ceiling trees and decorated them with homemade items like popcorn strings, marzipan cookies, nuts, apples, and candles, reports the The Mint Hill Times. The introduction of electricity brought about string lights instead of candles, as Thomas Edison also created the first strand of electric lights in 1880, which he strung outside of his Menlo Park Laboratory, according to the Library of Congress. Two years later, his friend and partner, Edward H. Johnson, hand-wired 80 red, white, and blue lights that he wrapped around a Christmas tree. By 1903, General Electric offered pre-assembled kits for everyday customers to buy. In 1923, President Calvin Coolidge started the tradition of lighting the National Christmas Tree with 3,000 electric lights. And less than a decade later, in 1931, the very first Rockefeller Center Tree was lit - an occasion that soon became a trademark sign of the holidays. Today, many famous displays stand tall around the world, including the Pope’s Christmas Tree in Vatican City, the Floating Christmas Tree in Brazil, and the Murano Christmas Tree in Italy. So as you go to hang your ornaments this year, think about how far the Christmas tree has come. And remember, it represents a time of peace and prosperity - something we could all use a little more of as we cozy into the holiday spirit. Re: Why Do We Have Christmas Trees? The Christmas Tree is Baal's phallus adorned with human sacrifices (represented by the ornaments hung on it) and topped with the Star of Remphan (Saturn, aka Chiun, aka Baal). Baal being a Canaanite version of (among other things) Osiris, who got chopped up into pieces by Set and was put back together by Isis - except for his genitalia, which couldn't be found. Thus, the phallus as a symbol for Osiris the god of the afterlife and "eternal life". Reincarnated as his son Horus. So the original trinity, Osiris, Isis, and baby Horus, reimaged in nativity scenes and catholic icons and statues as Baby Jesus (Horus), Mother Mary Queen of Heaven (Isis), and Joseph as the stand-in for God (Osiris). The Holy Family of none other than Nimrod, his wife Semiramis, and son Tammuz (Nimrod reincarnated). So, merry Baal-Mass, I guess. I have a Christmas Tree because it is a great memory from my childhood and because mine is especially gorgeous. I added mint birds with hints of gold coming through. Staying with the heavy mercury glass theme - individual gold, silver, white/silver pinecones, red - and adding the touch of mint/gold this year. Love it!! My tree skirt is a red Kate Spade. PO, please attach pic of decorated phallic symbol! Last edited by n david; 12-04-2018 at 01:43 PM. Right. I doubt that was on her mind. 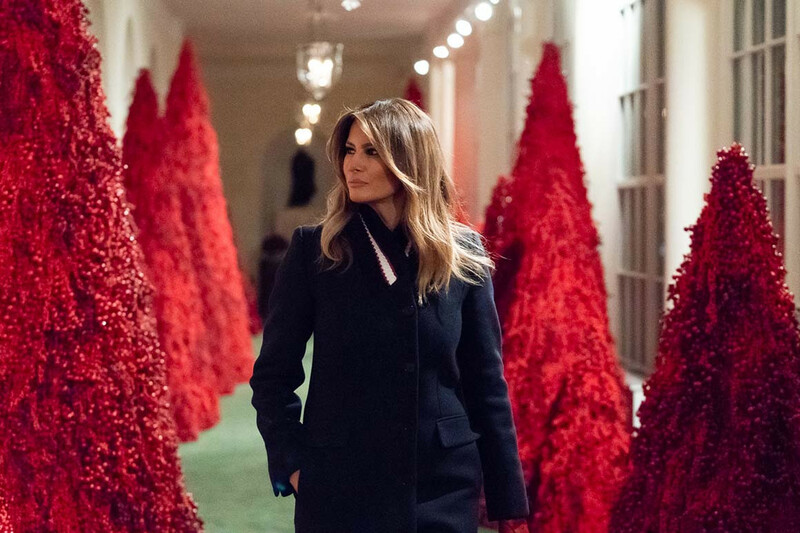 Well, I searched red christmas trees and it came back with how the red is to honor Diana. It included other things as well, but I won't post those.